Be notified by email and text message when St. Albert RCMP releases information to the media – you choose which topics are of interest to you. Distribute our crime prevention flyers with the invitations to your block party and get free hamburgers and hot dogs, barricades to block your street, sports equipment, activities for kids, and more. Use this app with your Android smart phone to report non-urgent problems such as graffiti, disrepair, potholes, etc. The app can be used anywhere in Canada. Anti-theft licence plate fasteners are free for St. Albert residents, and can be installed and removed with a special screwdriver bit. However, we must see each vehicle to determine what thread type and length of bolt is appropriate. Call 780.460.4276 to arrange for installation. 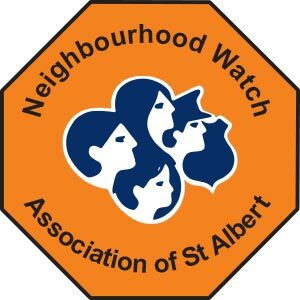 View a map of the last 2 weeks of crime activity in St. Albert. Store the serial numbers of your bicycles, electronics and other property on this web site. If an item is lost or stolen, you can notify police and get it back when it is recovered. Remind your tenants to not give strangers access to secured premesis. Neighbourhood Watch strives to educate the public and to encourage their active participation in crime prevention programs.